Subject : Effect of sequence and imaging plane in diagnosis of Multiple sclerosis. 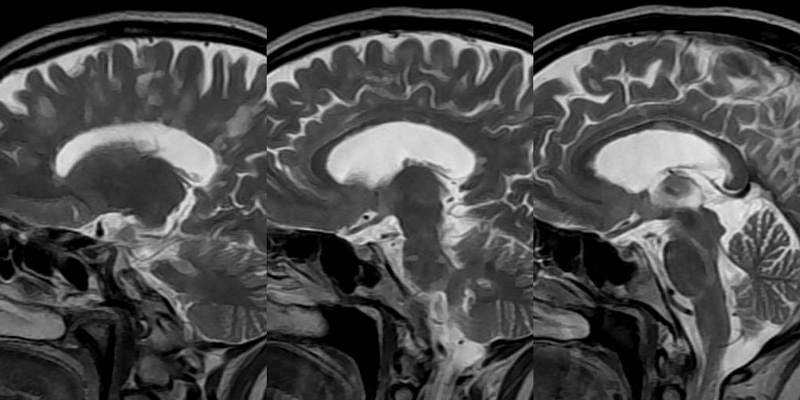 Imagingwise multiple sclerosis is characterised by multiple plaque of demyelination in brain; in peri ventricular white matter and callaso septal groove. Typically these plaques are linear to ellipsoid oriented perpendicular to ependymal lining of lateral ventricles. Demonstration of callosal, calloso -septal interface lesions and the plaques with perpendicular orientation to ependymal lining of lateral ventricle is pathognomonic of multiple sclerosis on imaging. Studies conducted with two independent observer groups in patient’s of multiple sclerosis to show effect of sequence and imaging plane in diagnosis of Multiple sclerosis. Among all MRI Pulse sequences, T2 appears to be the most sensitive sequence to pick up the lesion. In T2, Sagittal T2 appear to demonstrate significantly more MS plaques than axial section, especially in the periventricular region, callosal-septal groove and the corpus callosal lesions. This can be explained by partial volume averaging and by the antero posterior orientation of corpus callosum. Axial and Sagittal T2w MR images of a patient with multiple plaques of demyelination consistent with clinical diagnosis of MS.
Axial T2 have shown most of the lesions in peri ventricular white matter but the important or pathognmonic one are the callosal and calloso septal interphase lesions with their perpendicular orientation are elegantly demonstrated on midline and near midline Sagittal T2w sections. Conclusion: Sagittal T2 appears to be the most sensitive sequence in depiction of Plaques of Multiple Sclerosis.